From Goodreads ~ You can’t stop the future. The only way to learn the secret ... is to press play. Clay Jensen returns home from school to find a strange package with his name on it lying on his porch. Inside he discovers several cassette tapes recorded by Hannah Baker - his classmate and crush - who committed suicide two weeks earlier. Hannah’s voice tells him that there are thirteen reasons why she decided to end her life. Clay is one of them. If he listens, he’ll find out why. Clay spends the night crisscrossing his town with Hannah as his guide. He becomes a firsthand witness to Hannah’s pain and as he follows Hannah’s recorded words throughout his town, what he discovers changes his life forever. One day Clay, a high school student, gets a mysterious package in the mail with seven cassette tapes, which were recorded by Hannah, a classmate who recently committed suicide. The tapes had been sent to other people before Clay received them. He is instructed to listen to all seven tapes and then send them on to the next person. 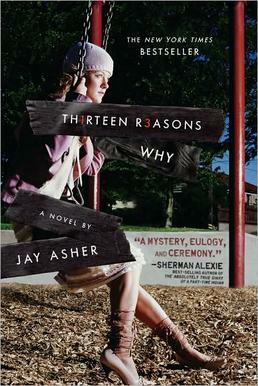 As he listens to the tapes, he discovers there is a side for each person (thirteen sides/thirteen reasons) including himself, who Hannah says cause her to commit suicide. I wasn't crazy about this book for a couple reasons. First of all, I wasn't buying that these thirteen people were the reason Hannah committed suicide ... she committed suicide because she chose to commit suicide. It doesn't sound like she was happy to begin with and was looking for an excuse. I thought the reasons why she blamed the thirteen people were fairly lame so I don't think it was fair of her to blame them. It is written from two perspectives. In italics was Hannah's voice on the tapes and in bold were Clay's thoughts and reactions to what he was hearing. They appeared on the same pages in paragraphs right after each other so I found this a bit distracting ... it took me a while to get used to it. Also, I found the writing and the story kind of boring. Maybe because as an adult I'm not the target audience, but I didn't have a lot of sympathy for Hannah. I didn't find her overly likable. I knew she had committed suicide but I didn't feel bad about it. And I was surprised that Clay's mother, knowing that something was bothering her son and that he was lying, would let him stay out late and wandering around the town "working on a school project".